THE OTHER DAY IT WAS SO BLUSTERY AND COLD that I decided soup was in order. A nice between-season soup is the leek-potato one, and you can add fresh parsley or other greens to it just before serving to give it a fresher spring flavor. I found that I’d written a blog about it years ago, and it sounded good enough to recycle. It reminded me to sweat those leeks (awful as it sounds)! And though I was lacking stock or broth of any kind, I just used water and it was still just fine. With some bread or popovers, and perhaps a salad — I’d call it a meal fit for the season. Fresh leeks are a glorious, yet humble, sign of spring. A few years ago, when I was visiting Cathy in California, a neighbor brought over a big bagful of freshly picked leeks, and I set to work on some leek-potato soup. If the leeks are very fat, slice them vertically before cutting your horizontal slices. I had never been quite happy with the texture of leeks in the soup I’ve made previously, so this time I consulted Cathy’s cookbook from America’s Test Kitchen, and these experts supplied the ultimate tip: sweat the leeks. It’s not the most attractive term, but basically it means that you saute the slices of leeks in some oil or butter (use your judgement for how much) and then put a lid on top for 15 minutes or so. The leeks continue to cook in their own moisture, and they will become meltingly soft and intense. Now all you need to do is to add some vegetable or chicken broth, a bay leaf and perhaps some thyme, salt and pepper, and a few potatoes — red or white or Yukon gold — cleaned and cut into about 1/2-inch dice. You can leave the skins on if you like. Cook till the potatoes are soft, then smash some of them against the side of the pot to thicken the soup. It’s nice left chunky like this, with pieces of potato and leek in your soup bowl, or you can blend some or all of it for a silkier texture. Some minced parsley or other greens, and a dusting of Parmesan, is good just before serving. I found this advertisement in a store flier. Were the mushrooms leaking out of the strudel? Do not confuse a leek with a leak. If in doubt, please contact me for proofreading advice. Many years ago, when my dad was in his late 80s and early 90s, at least once a week, he would call me about 5 p.m. and ask me that question. It was a great way to start a conversation — even on days when I really had no idea what we would have for supper and could laugh with my father about my lack of a plan. At 5 p.m. Pacific Time, it was already 7 p.m. in Chicago so my parents had eaten and the dishes were cleared, and I could find out what they’d had for supper. Although I will always miss hearing my dad asking me that question, I’ve taken his cue and often ask my adult children that same question. There is a difference: while my father was not planning to replicate my recipes, both my children are great cooks, and often finding out what they’re making for supper gives me a good idea what to make. After we hung up the phone, I went into the kitchen and scrounged around. Sure enough, I had all the ingredients for such a pie. Previously, Aviva had showed me about cooking the vegetables (in this case, a little onion, some celery, carrots, chopped potatoes and sweet potatoes, peas, etc. etc.) and chicken if desired, in a cast iron skillet, then making a sauce with a flour-butter roux and putting the biscuit batter on top. The beauty of this method was the one-skillet method — which I’ve written about in a former post (which also includes a puff-pastry topped pie and a delicious lentil-carrot soup which I intend to make again soon). The next day, Aviva and I compared notes on our pot pies. She’d warned me that the sauce (gravy?) might get too thick, by the time the biscuits were baked — and mine was. Aviva said she’d overcompensated and made the sauce too thin. I think that next time, I will put the filling in a regular pie pan (which has less surface area) so the filling won’t get quite as much direct heat. Like life, cooking is a work in progress. What are you making for supper? p.s. (By the way, though you can use any type of biscuits atop your pot pie, I do like Mark Bittman’s recipe for a cobbler-style biscuit topping). Blackberry-blueberry jam, an attempt to get the blackberry flavor with fewer seeds. I MARKED THE 8TH ANNIVERSARY OF THIS BLOG, by picking a tub of wild blackberries and making a blackberry cobbler. The first post that I wrote here, in 2009, was about the culmination of eight blackberry cobblers (!) that I made that summer. Well, I only made one this summer, but I can report that the recipe still holds up well and is suitable for any kind of berry. Cobbler and Blueberry Boy Bait are old friends during berry season, recipes I can count on–so familiar I can almost make them by instinct. Speaking of instinct, my dear friend Martha and I read a post touching on this subject in one of our favorite food blogs, Juls’ Kitchen, written by Giulia, a cook and writer in Tuscany (We read it in the Italian version first, as we’re studying the language and she writes so well.) She wrote about making a cake by instinct — and it made me think about the dishes that I make instinctively, or almost so. Since it’s summer, and I’m enjoying my small crop of cherry tomatoes and basil, grown in pots, one of the simplest and best pasta dishes came to mind — an easy one to make by instinct. I cut the tomatoes in half, add some garlic and a dash of salt, and cook them down a bit to release their juices. Then I add a little of the cooking water from the pasta, toss in a good dose of chopped basil, stir the cooked, drained pasta into the skillet, and sprinkle with grated Parmeggiano or Pecorino Romano. Done. 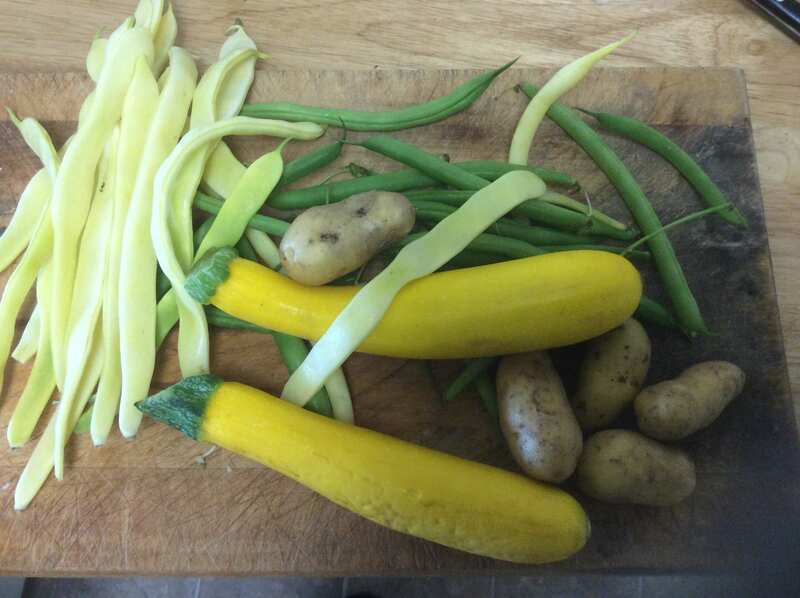 The best old friend of the late summer menu: I can never have too much of it. Leftover wild salmon, leftover rice, chopped cucumber and cherry tomatoes, corn kernels, chopped green onion, cilantro and a dressing of lime juice with a little oil and salt. Summer, with its bounty of vegetables, is also such a great time to compose salads. I don’t know if there is an art to this, but I think there is something of an instinct, developed over time, of putting foods together so they marry well. Contrasts of color, flavor and texture work well in a composed salad. Leftovers and seasonal specials are equally welcome. It’s not that my instinct is always so great–some salads I’ve made did not marry well — in fact, probably needed to divorce! But usually, my instincts are not too bad and the ingredients get along pretty well — even complementing each other. Especially in the lazy days of summer, I tend to forget what I can put together for a simple meal, and I need inspiration from something I’ve seen or read, which I can then adapt to what I have. The salad above that was like that — I was just reading about a lime-juice salad dressing, and then put this together from leftovers and farmers’ market produce. Then, as I was sorting through photos for this post, I looked at the photo of this salad and realized I could make it again for today’s lunch, even though I was missing the rice and had more cucumber. Avocado would be nice in this salad too, or black beans, or red pepper. You could make it vegan without the salmon. You could use parsley instead of cilantro if you are one of the 4-to-14 percent of the population that thinks cilantro tastes like soap. You could add some sesame seeds or nuts on top . . . There are as many salad variations as there are mathematical combinations of vegetables with grains, beans, protein, what have you. Here’s a post with some of my late-summer favorites from seasons past: https://tobykitchen.wordpress.com/2011/08/17/salads-salads-salads/. MY FRIEND NANCY knew that I often baked bread using Jim Lahey’s no-knead approach, using the Dutch oven to make a crusty round or oval loaf. She’d tried a lot of Lahey’s recipes, and one favorite was the stecca (“stick” in Italian), a small and thin baguette-like loaf that incorporates olive oil as well as the usual flour-water-salt and yeast combo and is baked on a baking sheet rather than a Dutch oven. Nancy’s partner, Duane, is Steve’s brother, and he would gladly eat stecca every day. After Steve and I tried it at their home in California, we fell in love with it too, so Nancy copied the recipe for me. When I got home, I made it once or twice. It was a little messy — as Nancy had warned me, the tea towel was permanently marred by impossible-to-remove oil stains–but very, very good. Still, maybe because it was a bread that should be eaten in a day or two rather than a loaf to last for days (sometimes almost a week), I forgot about it and didn’t make it again for a year or two. That all changed recently. I came across the recipe and thought I’d try it again. It was so easy — as long as I started it the night before we wanted to eat it — and made a wonderful accompaniment to soup or salad. It was delectable on its own with a bit of butter or some cheese. I made it again and again, playing around with variations, substituting a bit of whole wheat flour, sometimes adding seeds to the top. Now I’m making it often, but only half a recipe at a time. Not that we couldn’t eat four stecca loaves in two days (it would be very easy to eat a stecca loaf by oneself in one sitting, especially if it’s still warm from the oven) — but it’s probably better if we don’t. Isn’t it amazing what just 1/4 of a teaspoon (or 1/8 in the half recipe) will do, given a bit of time? Maybe there’s a moral there: Give it time. I tweaked Jim Lahey’s recipe just a little. This is the recipe for four little sticks of bread. In a medium bowl, stir together both flours, table salt, sugar and yeast. Add the water, and using a wooden spoon or your hand, mix until it comes together as a wet, sticky dough. Cover the bowl and let it sit at room temperature until it is dotted with bubbles and the dough is more than doubled, 12 to 18 hours (a few more won’t hurt). When the first rise is complete, generously dust a work surface with flour. Use a rubber spatula to scrape the dough out of the bowl. Fold the dough over itself two or three times and gently shape it into a somewhat flattened ball. (If it is too sticky, you may need to first add a little more flour, but it should still be quite a moist dough). Place a tea towel on the work surface and generously dust it with cornmeal. Place the dough on the towel, seam side down, and brush the top with some of the olive oil. Sprinkle top with 1/4 teaspoon coarse salt and a light dusting of cornmeal. Fold the ends of the tea towel loosely over the dough to cover it and place in a warm draft-free spot to rise for 1 to 2 hours. The dough is ready when it is almost doubled, and when you gently poke it with your finger it holds the impression. Half an hour before the end of the second rise (approximately) preheat the oven to 400 degrees F. with a rack in the center. Lahey says to oil your 13-by-18 baking pan, but sometimes I don’t oil, and it’s been fine. Cut the dough into quarters. Gently stretch each piece more or less evenly (mine is always a little uneven, but it’s part of the charm) approximately the length of the pan. Brush with olive oil (you may not need the entire 1/4 cup) and sprinkle with remaining 1/2 teaspoon coarse salt. Sprinkle with sesame, poppy or other seeds if you like. Bake for 14 to 20 minutes (I find it’s done at 14 or 15 minutes), until the crust is golden brown. Cool on the pan for five minutes, then transfer the stecca to a rack to cool (or not, if you must have some now). NOTE: The crust of the stecca is thinner than a baguette, and the combination of the oil and salt may make it soggy in just a few hours. You can reheat the loaves in a 350 degree oven for a few minutes until the crust crisp but watch carefully — the stecca is so thin that it may turn into a cracker very quickly! I KNOW IT’S A CLICHÉ to write about “comfort food,” but the anxiety I’ve experienced since the election has made comfort seem more necessary than ever. There is something calming about the normality of cooking, especially if you’re making something both comforting and nourishing. Last week I made a mushroom-chicken pot pie topped with biscuits that fit the bill. Aviva showed me how to do this basically in one pot: saute onions and garlic with your choice of vegetables –some options: mushrooms, chopped potatoes or sweet potatoes, carrots, peas, cauliflower greens– in butter and/or oil in a cast iron skillet. Add a few tablespoons of flour and seasonings (salt, pepper, rosemary or thyme) and then add enough broth (chicken or vegetarian) to make a nice “gravy” for your pie. Add cooked chicken or leave it out for a vegetarian version. The sauce should be a little thinner than you want it as it’ll thicken in the oven. You can top with a biscuit dough, as I did here (Mark Bittman’s biscuit topping works well) or with a typical pie crust. Or, for the easiest method, do as I did recently and use puff pastry (buy it frozen and thaw it). Lay a circle of puff pastry over your filling, and cut a few slits for the steam to escape. For any of these toppings, bake at 400 degrees for about 30-40 minutes, until the filling is bubbling and the biscuits or other crust is golden. The pot pie is a little more ambitious than my usual comfort nourishment though. I gravitate toward the simplest form of cooking. Faithful readers of this blog (thank you!) know that I love SOUP, especially in fall and winter, when my go-to supper is soup and bread (or toast, popovers, cornbread, etc.). In just the last few weeks, I’ve run through a lot of my soup favorites: lentil with spinach and lemon, parsley-potato; chicken soup with matzo balls, red lentil soup; and of course, minestrone. My latest soup creation is another lentil soup, this time with lots of carrots to brighten its color, and some seasoning to perk up the flavors. I adapted it from a recipe by British food writer Diane Henry for “Turkish carrots and lentils with herbs” in the book Plenty (no, not the Ottolenghi Plenty). Henry’s recipe is more a side dish with fewer lentils and no real broth; I doubled the lentils and added more water for a soup-ier version. She suggests fresh mint, parsley or dill for the herbs — I chose to use cilantro (but I do want to try the mint version sometime.) Henry also adds 2 teaspoons of sugar, but I left it out; it didn’t seem to need it. The coriander seeds and red pepper, along with the lemon and herbs give it a bright and lively flavor. This first serving was more stew-like; when I heated it up the next day, I added more water to make it more of a soup. Really good either way. Heat the oil in a saucepan and saute’ the onion until soft. Add garlic and spices and cook for two minutes. Then add everything else except the cilantro and lemon juice. Bring to a boil and cook until tender, about 30 minutes. Add more water or broth as you like — it can be more of a lentil stew or a soup. Adjust the seasoning, adding salt and pepper to taste. If desired, add a glug of olive oil to the soup (I don’t but you might want to). Ladle into bowls, adding a generous squeeze of lemon juice and a good sprinkle of cilantro into each bowl. I love Diane Henry’s concise description: “This shows just how delicious frugality can be.” And comforting too. BLACKBERRY SEASON is making me a little nostalgic. Blog-nostalgic, that is (though I still think blog is a particularly ugly word), as I wrote my first post on Toby’s Kitchen Notes nearly seven years ago, toward the end of berry season, with my recipe for Blackberry Cobbler No. 8. It seems hard to believe I’d made eight versions of blackberry cobbler in 2009, but I did, along with some other must-have fruit desserts. This year, as I write, it’s just the beginning of blackberry season, and the other day I had a couple freshly picked pints on hand. I really wanted to bake something with them — but not a dessert. Aha — it remembered Nigel Slater’s marvelous recipe: Blackberry focaccia. Blackberry focaccia has only a hint of sweetness, from sugar sprinkled atop the dough. The yeast dough is easy, but does need gentle handling, especially when you fold in half the berries after the first rising. The rest of the berries are strewn on top; then, it rises again and you drizzle olive oil and sprinkle demerara or sparkling sugar on top. Once out of the oven and cooled just a bit, you can sprinkle with confectioners sugar if you like. We had a choice: ruin our appetites by devouring the focaccia immediately or wait a few minutes, make a green salad, and call it supper. We chose the latter — and it wasn’t a sacrifice. Calling it supper gave it a certain sense of legitimacy, if not outright virtue. (More nutritious than pancakes with syrup for supper, anyway.) And yes, it was delicious. I plan to repeat this combo! THE ENTRY FOR LENTILS in the Oxford Companion to Food follows closely behind the one for lemons — and that seems right, as lemons add brightness to this easy-to-cook-but-sometimes-a-little-dull legume. A recipe on my lemon blog for Lemony Lentil Soup with Spinach (scroll to second recipe) is testimony to this great marriage. Lentils have been cultivated since antiquity in Egypt, and evidence of lentils has been found in many prehistoric sites in Europe. In India, the largest producer of lentils today, they are an everyday food called dal, often cooked with onion and spices and served with rice. Next to soy beans, lentils have the highest protein content of all vegetables. There are dozens of different colors and sizes of lentils, each with their own character. Brown or green lentils are fine, but red lentils are very nice for soups as they cook quickly and break down into a puree. And, of course, there’s the color. Some of that lovely salmon color fades with cooking, though, so I was happy to find New York Times’ food writer Melissa Clark’s recipe for Red Lentil Soup with Lemon, which adds carrots and tomato paste to the pot to bring some of the color back. And this time of year, when it’s often grey and dismal outside, I really appreciate a burst of color in the soup bowl. Another thing to love about this soup is that (as long as I’ve got the red lentils in the pantry), I usually have all the ingredients on hand. Lemon, onion, garlic — check. Cumin, chile powder or cayenne, tomato paste — check. I don’t always have fresh cilantro, but parsley or even chives will do in a pinch. I made some popovers and a green salad to go with it, and called it supper. IT’S THAT TRANSITION TIME — warm and summery one day, cool and rainy the next. During the cool rainy (and windy) days last week, I wished I had some soup to eat. . . but I didn’t feel like making my usual fall and winter soups. I didn’t want to rush the season. 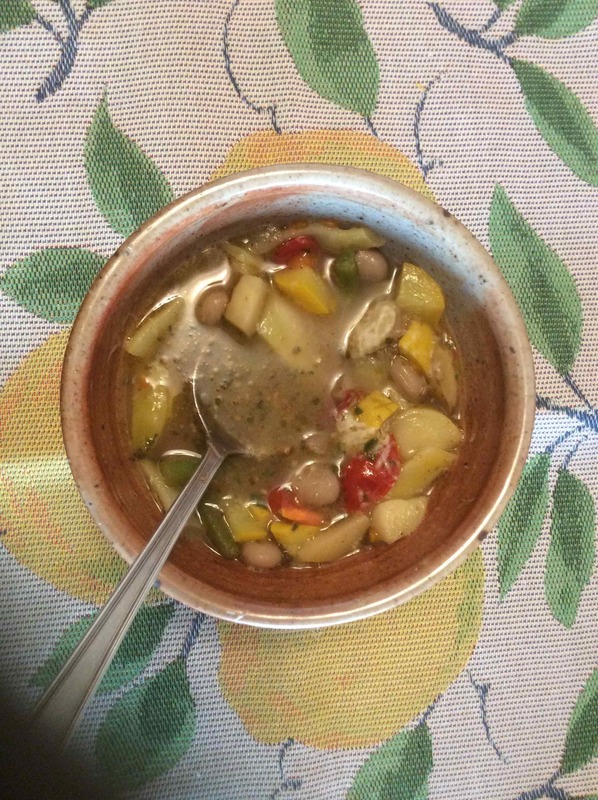 Then I saw this article and recipe in the New York Times for soupe au pistou, the Southern French vegetable soup flavored with basil (usually a basil pesto without the pine nuts). The lovely thing about this particular recipe by David Tanis is that it uses all those vegetables that are in season right now, in September. However, it’s also very adaptable, and there are countless variations. 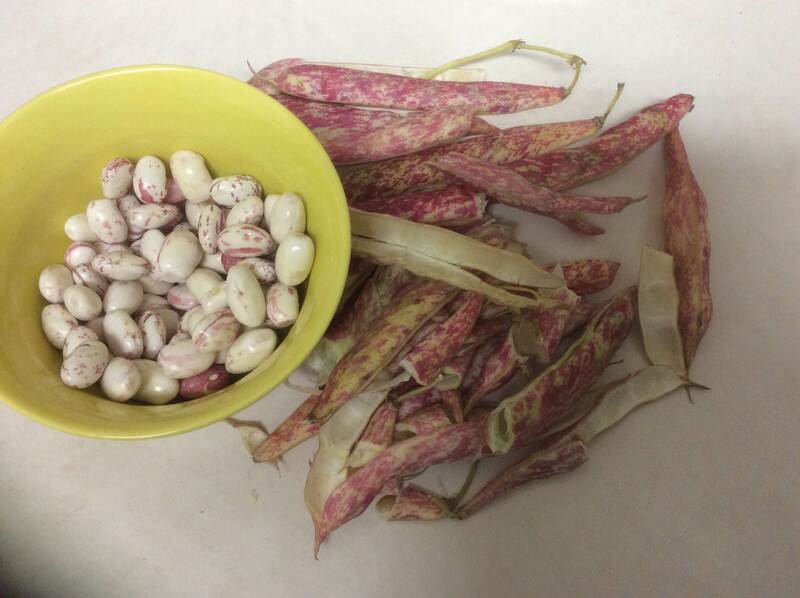 For example, in a second batch I made, I cooked dried, soaked white beans instead of the cranberry beans. (Yes, I imagine you could substitute canned beans). And I couldn’t find romano beans, so I just used more regular green beans. Another adjustment I made to the recipe was to skip the separate step of blanching the vegetables, and just cook them right in the pot (as one reader suggested), to my liking. I kept them bright and slightly crunchy for the first serving; the next day, when I reheated the soup, the vegetables were less bright but more tender. Both variations were good. Some people use rice or macaroni instead of potatoes, or insist that tomatoes are essential if you want to call it soupe au pistou (Here, for example, is a completely different recipe). I like the potatoes, though, and I think the soupe is fine with or without the tomatoes. Since I’ve never had an traditional soupe au pistou, I can’t judge its authenticity except to say I like this soup, whatever you call it. The dollop of basil pesto (without nuts, but if you have some usual pesto on hand, no one will object) adds a distinctive seasoning, but this soup is flavorful even without it (maybe then you should call it something else). Really, this soupe au pistou is so good that it led me right back into the soup-making season–without regrets. 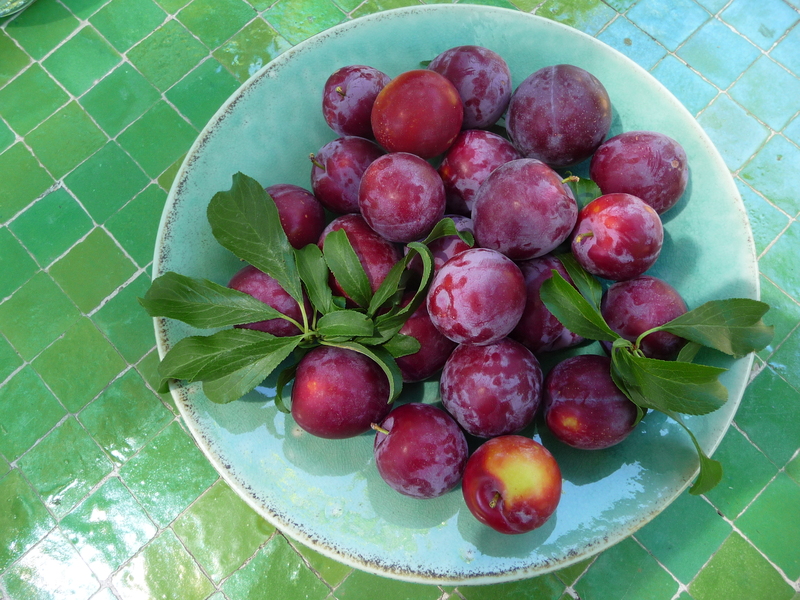 I HAVE WRITTEN BEFORE about the marvelous Santa Rosa plums of early summer, and my gratitude to Luther Burbank for developing them. But again I feel the need to praise these plums. If I were to have just one fruit tree, it might have to be a Santa Rosa plum, not only for their deliciousness at the start of summer, but also because they are so hard to find in the market. I had enough, briefly, to eat plenty of plums au naturel and to make British cookbook writer Nigel Slater’s brilliant plum tabbouleh. (I did substitute a pinch of crushed red pepper for the small red chile he calls for). I even made some plum crumble with a topping of butter, brown sugar, flour and hazelnuts. 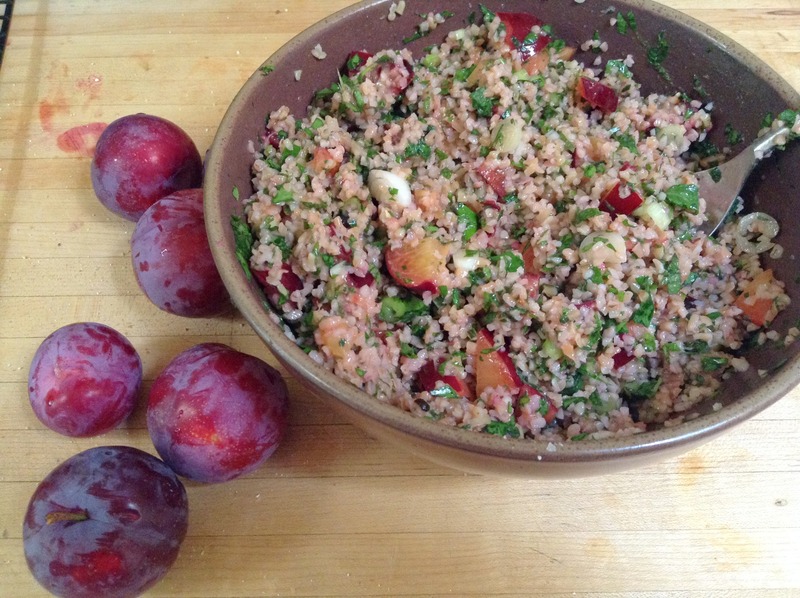 The plum tabbouleh drew me back to one of my favorite books, Ripe: A Cook in the Orchard, and to Nigel Slater’s lovely homage to plums. And why are these plums so hard to find? Although Slater is speaking of Britain and not of Santa Rosa plums, I think his sentiments could apply to the U.S. as well. 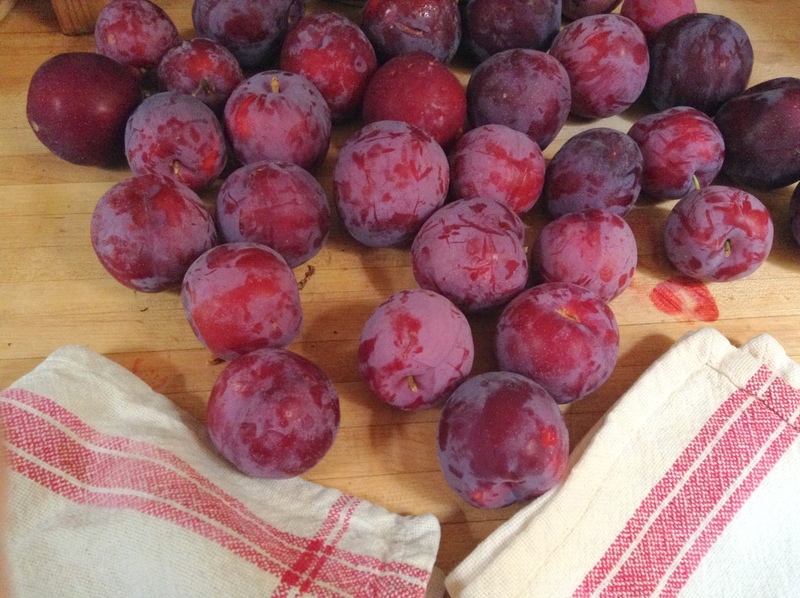 Well, I salute all plum growers, and in particular my friends John and Cathy who gave me the pleasure of a few days full of plums from their Santa Rosa plum tree. What a happy welcome to summer!